My mind began turning, and I made up a HUGE list of popcorn combination ideas. I didn't know where to start! I wanted to make them allllll. So be warned, there will be many popcorns coming in our future! To be honest, I don't really like a lot of butter on my popcorn. A little ironic, isn't it? Since practically everything I make has butter in it. But really, I enjoy plain popcorn, and maybe a little salt. However, throw in something SWEET on my popcorn? And I'm in hog heaven. It's that salty-sweet combination that I just can't get enough of. Remember my Sea Salted-Chocolate Chip Cookies? Saltine Toffee, anyone? And who doesn't LOVE Chocolate Covered Pretzels?! Yeah, I know I'm not alone here! If you're not drooling yet, prepare to be. I give you: S'MORES POPCORN!! Fits comfortably into your movie night, AND campfires! I can't wait to brown-bag it to the movie theaters with this stuff. (What did you think big purses were for?). Put them into bowls, or roll them into balls, or you can give them away in cute little bags as gifts. They'd be a great treat for the 4th of July; they pair nicely with firework-watching. S'mores are pretty much a universal love language. And I think we could say the same for popcorn. Put them together; and you have a love language baby! Or maybe not.. but you do have something realllly good! 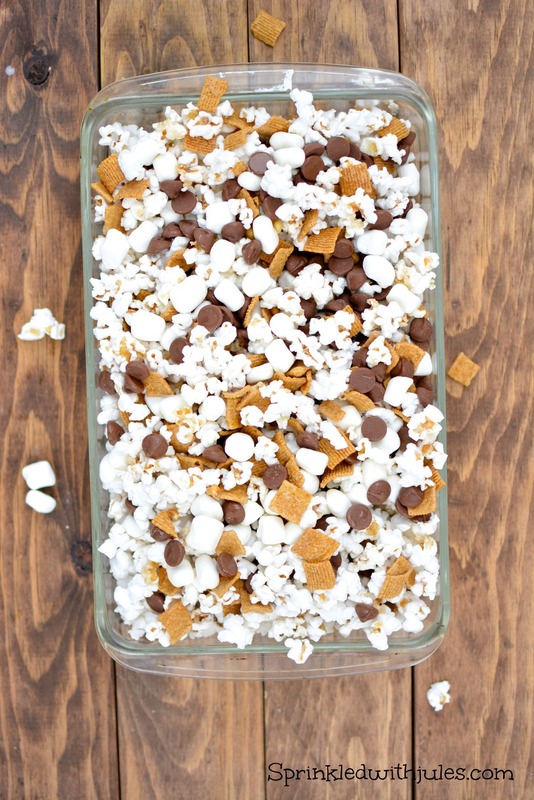 All you need is some popcorn, graham crackers/golden grahams, chocolate chips, and mini marshmallows! Mix in alllll the fixin's. Graham crackers, or Golden Grahams..
And the "choco-choco-chips"! Anyone know what that's from? You could leave it just like this. Or you can melt it..
And heat it all up in the oven! We want it nice and melty. Stir it up, and serve hot or cold! Pop the popcorn according to its instructions. In a large bowl, mix in marshmallows, graham crackers, and chocolate chips. Spread evenly into a large pan. In a small bowl, combine melted butter with vanilla. Drizzle the butter/vanilla mixture all over the popcorn in the pan. Warm the pan in the oven at 300 degrees for 5-10 minutes, until it reaches your desired meltiness (marshmallows and chocolate chips). Serve in bowls, or roll into balls, and ENJOY!